40mm stainless steel case, stainless steel crown, silver dial with mother of pearl center, automatic movement with hours, minutes, seconds, date, chronograph seconds hand, 30 minute counter and 12 hour counter, approximately 42 hours of power reserve, black alligator strap, stainless steel pin buckle. Water resistant to 50 meters. 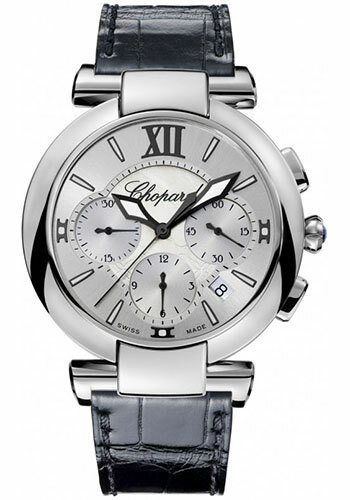 40mm stainless steel case, stainless steel crown, silver dial with mother of pearl center, automatic movement with hours, minutes, seconds, date, chronograph seconds hand, 30 minute counter and 12 hour counter, approximately 42 hours of power reserve, stainless steel bracelet, stainless steel folding buckle. Water resistant to 50 meters. 40mm stainless steel case, stainless steel crown, diamond bezel, silver dial with mother of pearl center, automatic movement with hours, minutes, seconds, date, chronograph seconds hand, 30 minute counter and 12 hour counter, approximately 42 hours of power reserve, black alligator strap, stainless steel pin buckle. Water resistant to 50 meters. 40mm stainless steel case, stainless steel crown, diamond bezel, silver dial with mother of pearl center, automatic movement with hours, minutes, seconds, date, chronograph seconds hand, 30 minute counter and 12 hour counter, approximately 42 hours of power reserve, stainless steel bracelet, stainless steel folding buckle. Water resistant to 50 meters.